CLICK HERE to get quick, reliable test results and certified reports. CLICK HERE to simplify orders and ensure fast turnaround. CLICK HERE for new account forms and resources to make your job easier. Laboratory Testing Inc. (LTI) is a well-known leader in Materials Testing and Calibration Services located near Philadelphia, Pennsylvania (United States). LTI specializes in Metal Testing and offers customers full-service destructive testing and non-destructive inspection capabilities. Analytical chemistry services for powdered metals, ores, ferroalloys, composites and polymers are also provided. Lab Testing excels at preparing test results and certified reports quickly, conveniently and economically. NADCAP and A2LA accreditations, a stringent quality program and a team of technical experts help customers meet quality requirements and get reliable answers to important business questions. Since our founding in 1984, LTI has been providing business-critical services for customers in many industries, including aerospace, defense, power generation, medical and transportation. LTI is one of the largest independent testing laboratories with facilities and equipment capable of handling and testing materials and finished parts of all shapes, sizes and quantities. All materials testing and calibration services are provided at one location for easy scheduling and shipments. Many successful businesses rely on LTI’s destructive and non-destructive testing services to ensure the safety, reliability and integrity of their metal and alloy raw materials and finished parts. Our testing labs will provide the support and convenience you expect, as well as reliable test results and certified reports. LTI is one of the most trusted names in the materials testing industry. A large percentage of new customers come to us through referrals. 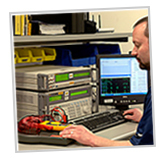 Our calibration lab, LTI Metrology, offers NIST traceable and A2LA accredited calibration services and certification. Don’t leave accuracy to chance. Ensure precision measurement and readings from your measuring equipment and tools. Ask about the On-site Calibration Services offered by our technicians in Pennsylvania, New Jersey, Delaware, and some areas of Maryland and New York (USA). Adjustments, repairs and new instruments are also available. Contact us to find out how our calibration and test labs will exceed your expectations with quality, service and delivery. » Watch Our VIDEOS to learn more! Our certified reports will meet all your requirements and results are easy to read. Ask for convenient certifications by email or use our customer portal.